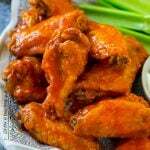 These baked buffalo wings are ultra crispy chicken wings tossed in a classic spicy sauce and served with ranch dressing. Snack away with less guilt! Buffalo wings are a perennial favorite, they’re perfect for parties, game day, or just when you have a hankering for a hearty snack. These buffalo wings are baked instead of fried, but are just as crispy and delicious as what you’d order at a restaurant. I absolutely love chicken wings, especially when they’re extra crispy. When I see buffalo wings on the menu at restaurants, I can’t resist! As much as I love wings, I hate the idea of frying them – so much mess and so many calories! These baked buffalo wings are my own version that are baked instead of fried, yet still come out plenty crispy. Serve them with ranch for dipping, and you’ve got an awesome snack or meal with less fat and calories. 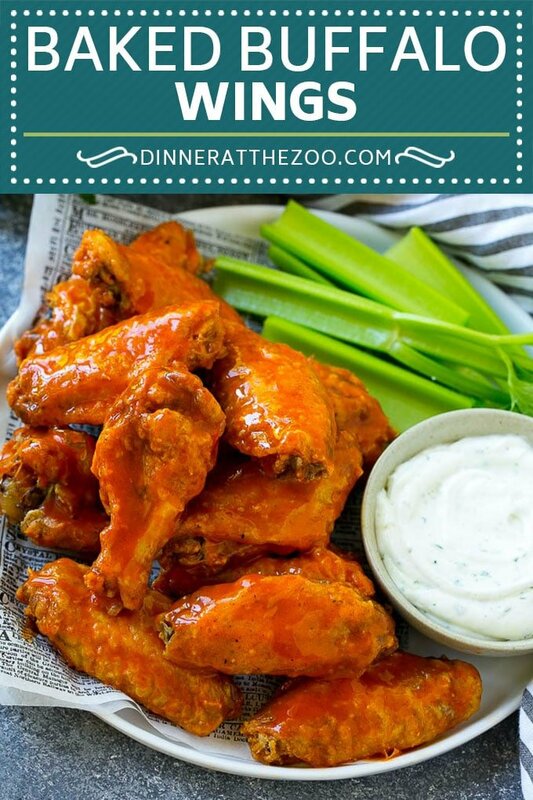 How do you make baked buffalo wings? 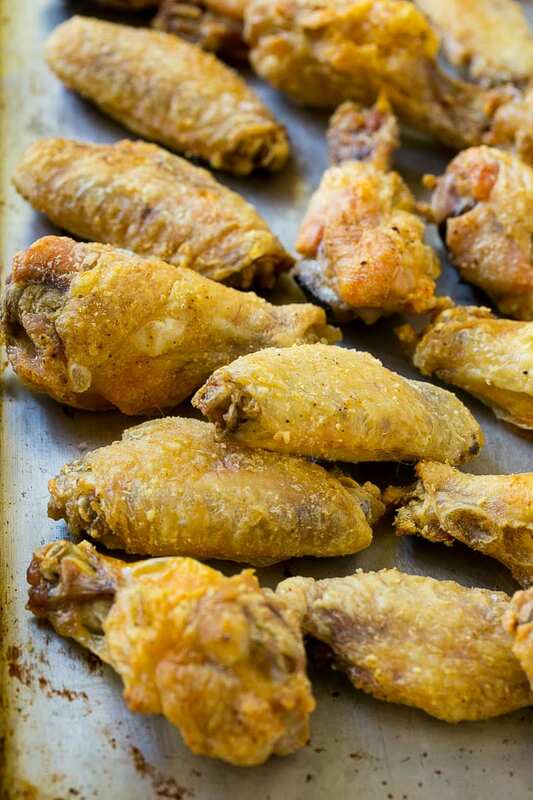 The secret to crispy wings without a lot of oil is baking powder. 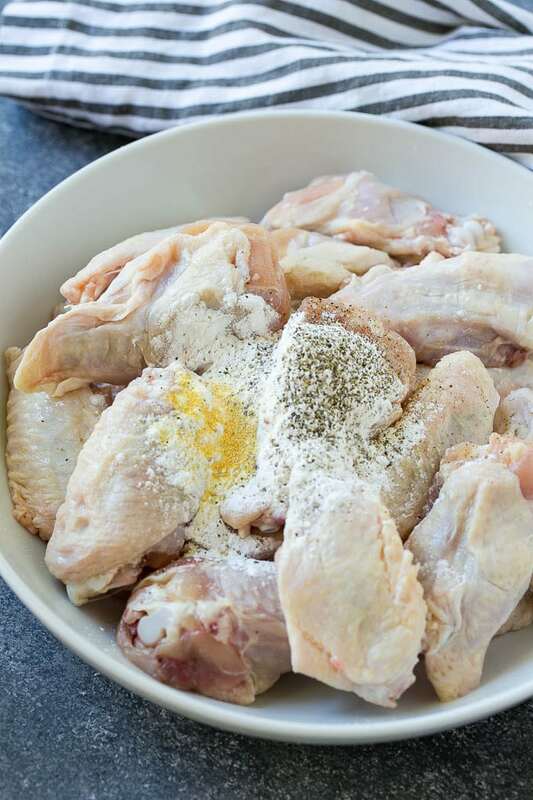 It sounds strange, but coating the chicken wings in baking powder and seasonings will help the skin crisp up nicely. You won’t taste the baking powder in the final product. Be sure to use baking POWDER, not baking SODA, there is a big difference between the two! After the wings are coated in baking powder and spices, they go on a rack to bake. It’s important to make baked buffalo wings on a rack so that the fat can drain off and the wings will be crispy on all sides. Chicken wings take about 45 minutes to bake. It may seem like a long time, but it’s important to render out the fat from the chicken wings so that the skin can crisp up. To complete these baked buffalo wings, we need to toss them in buffalo sauce. 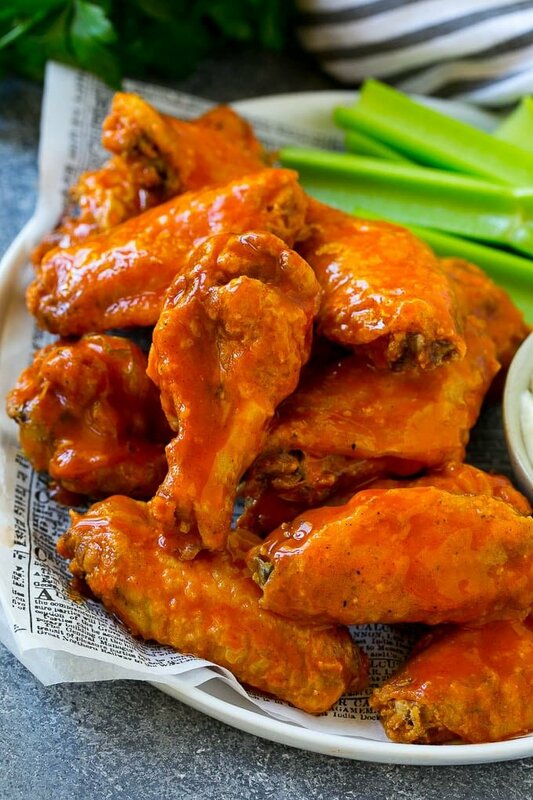 Buffalo sauce is made with Frank’s Red Hot Sauce, butter and a little honey. It’s that simple! The wings are coated in the spicy sauce, and then are ready to be served. I love that I can have one of my favorite restaurant indulgences at home for less effort (and less calories!). My husband also loves these wings, and if I’m serving them as a meal I set some aside without the sauce so that my spice-hating kids can also enjoy some crispy chicken delights. A winning situation all around! 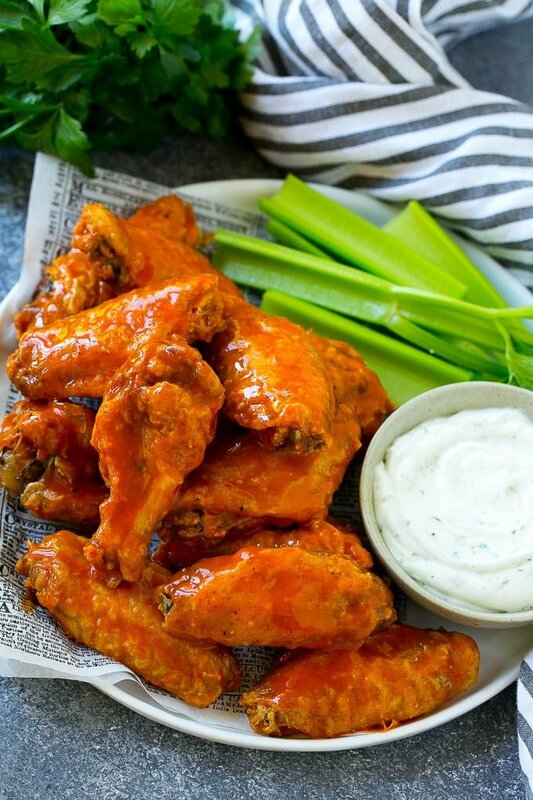 This recipe for baked buffalo wings is ultra crispy baked chicken wings tossed in a classic spicy sauce and served with a lightened up blue cheese dip. Snack away with less guilt! Preheat the oven to 400 degrees. Line a sheet pan with foil and place a non stick oven safe rack on top of the pan. Place the chicken wings in a bowl. Add the baking powder, salt, pepper, garlic powder and onion powder. Toss to coat the chicken evenly with the baking powder and spices. Place the wings on the rack in a single layer. Bake for 45 minutes or until wings are light golden brown and crispy. In a small bowl, whisk together the hot sauce, butter and honey. Pour the sauce over the wings and toss to coat evenly. Serve with celery sticks and ranch dressing. This post was originally published on August 31, 2016 and was updated with new content on June 13, 2018. Would it be ok to use a different hot sauce and still follow this recipe? Does the franks hot sauce have to be room temperature before you pour the melted butter? I made buffalo chicken bites awhile back it was great …. then I go to make it again the sauce got a little lumpy .. This is a great recipe – perfect and simple. I have made these wings about 5 times now and they are now my go-to for wings, having tried many others. The secret is the simplicity… baking is so much better than fried when done right. The rack is key, but also the proportions of spices are dead on. Thank you!! Are the breasts skin on? This recipe works best with skin on chicken pieces. Jow do you clean your wings and do you dab them dry with a paper towel before seasoning? 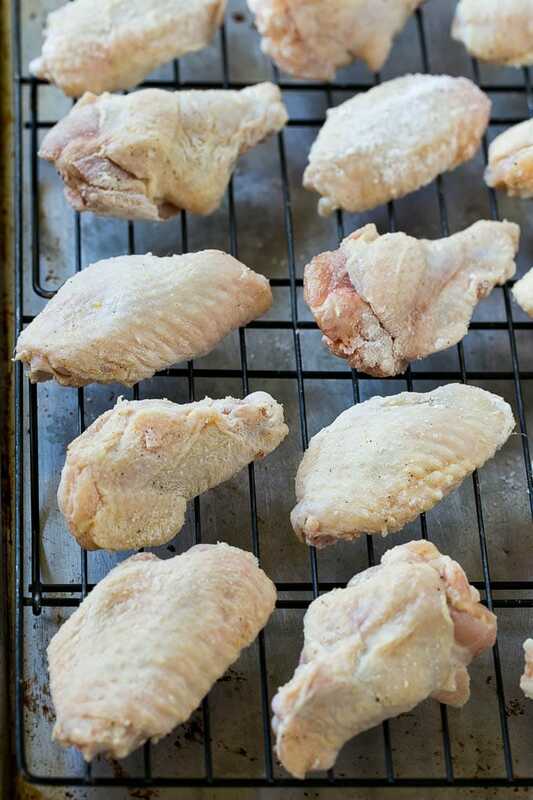 I made them but had let the wings season overnight but put the powder straight in with the juice and it didnt come out crispy and I think thats where I went wrong. I havent made them yet but I definitely want to try. I have three questions. 1.) Can I let them sit in the fridge in the spices and powder overnight? 2.) What rack do you use and where can I get it? 3.) Is the time the same for all ovens? Yes they can sit in the fridge overnight! Any baking rack will work like this one, you should be able to find it at most stores that carry kitchenware: https://www.amazon.com/Heavy-Stainless-Baking-Cooling-inches/dp/B017MWU59Y/ref=sr_1_1_sspa?keywords=baking+rack&qid=1552338858&s=gateway&sr=8-1-spons&psc=1. The time is the same for all conventional ovens, if you’re using a convection oven it would be 10-15 minutes less time. That’s what I did to mine. Love the idea of maple syrup, will try that next time! Thanks for reporting back! It’s delicious with real maple syrup as I didn’t have any honey. Does the 45 minute time matter on the number of Buffalo wings there are? The cook time will stay the same as long as the wings are in a single layer on the pan! I loved it. It was amazing I made it for me and my mom and we absolutely loved it, I mean geezzzz we were a little curious about the honey but you proved us wrong. honestly best homemade wings. Thanks so much!!! So happy to hear you enjoyed them, thanks for reporting back! So glad to hear everyone loved it, thanks for commenting! I have made these wings twice and they were delicious. Love this recipe. No oil splattering or mess to clean up. I just made these today in preparation for a Super bowl party and they came out great! I’m sure they’ll be a hit. Thanks! So happy to hear they came out well! Thanks for reporting back! Can you grill the chicken instead of baking? Yes that should work just fine, in that case I’d skip the baking powder. Can I use flour instead of baking powder? , I don’t have any. The baking powder makes the wings extra crispy, flour won’t work the same way. If you don’t have baking powder just omit it, the wings will still be great! That just what I did lol? Thank you and they were great! Omg these were sooo good! My whole family raved, best ever! So happy to hear you enjoyed them! Thanks for reporting back! what kind of spices do you use? Salt, pepper, garlic powder and onion powder! Recipe was easy to follow, and they turned out amazing! Thank you for sharing. Do ya think I could toss and leave in fridge for a bit? Toss with sauce or with baking powder? Baking powder, yes. I’d add the sauce right before serving so your wings don’t get soggy.